With our plans to put Blue Moose up for sale we needed to find a place to store her. The east coast of Florida does not have as many options as you would think. The problem with storing her in the water was the threat of possible hurricanes which would mean a speedy trip for us back south to make sure she was fine. Also the growth that accumulates on the hull in just a few weeks is incredible. We had a quote for bottom cleaning in St. Augustine of $2.50 a foot. This would be over a hundred dollars about once a month. After seeing the scum on our lines and fenders I’m not surprised they charge that much. All kinds of decomposing “things” floated by and sometimes got held against the hull by the current. The visibility under water is probably about 6 inches. We finally decided on Westland Marina in Titusville. We drove up to check it out because sometimes (lots of times) what you see on the internet is nothing like what you see in person. The marina is right off the Intracoastal Waterway and has a lift capable of hauling us out of the water. They have new bathrooms with good showers, a new laundry room and a lounge with TV and air conditioning. Plus, we could work on the boat ourselves. A lot of marinas don’t allow that. Perfect! Everything we need. I was looking after the paperwork end of things when they hauled her. That’s probably a good thing because I always get a little concerned about little things like, oh…dropping her! No worries. Rick drives the crane like it’s a little car and within a few minutes she was getting the pressure wash treatment. Then she was moved into her spot in the yard. By the way, Cricket stayed on board throughout all of this. After all she’s been through I’m sure this was no big deal. While we did have power and water to the boat while in the yard, our air conditioning only works while in the water. Also our holding tanks which had been emptied and cleaned meant that we would have to use the marina bathrooms. Time to get down to the cleaning and emptying. The summer weather had arrived and every afternoon brought rain. Along with temperatures in the mid nineties the clouds would start to build in the early afternoon and by 3 or 4 rain like I have never seen before would be slamming us. We usually started work early in the morning and tried to stay out of the sun to escape some of the heat. Thankfully, the canvas shop gave us an air conditioner to borrow while we were there. Even still the inside of the boat got pretty hot during the day. It’s a good thing we unloaded a lot of stuff while at the dock in St. Augustine. Even still we filled both the van and a U-Haul trailer with our belongings. Wow, did we have stuff! We easily had enough non-perishable food to last for months. Canned tuna, rice, coffee. Our stockpile of medications and toiletries would rival any pharmacy. I wonder what the shelf life is on Bandaids? I think we have 1000 and I’m not sure we used 1. So here are the pictures of the Moose empty. I have been thinking long and hard about how to title this post. First, I need to back up a few steps. I have one of those brains that the second I'm awake. I'm AWAKE. This quite often happens in the pre-dawn hours. I know, crazy. I could sleep until noon and nobody would know different, right? Not me. With the first flicker of an eyelid Cricket is in my face requesting, no...demanding breakfast. Before I give in to her my brain goes into fast forward. One thought produces 3, then 10 then, well it just keeps going. I do the stealth crawl over Brian, shh the cat and put the coffee on to perc. Then I begin. This is how I have been composing in the past few days. While the world is still dark and I think that I'm the only one awake. Brian and I are total opposites, as anyone who knows us has already figured out. Occasionally we do think in the same direction though. This is what happened some time about the beginning of April. After a radio call with friends, there was a long day without discussion of this conversation. At 4:30am the next morning we both started talking at once, decided to head north and that was that. So that brings me to today. We are sitting on a morning ball in Titusville Florida less than a mile from our final destination. Tomorrow morning Blue Moose is going to be hauled and put in the hard. Wednesday our broker is coming to list her for sale. I offer no apologies. This is right for us right now. In the beginning we had great plans of getting to Grenada and maybe further. It somehow seemed like a failure that we didn't do that. 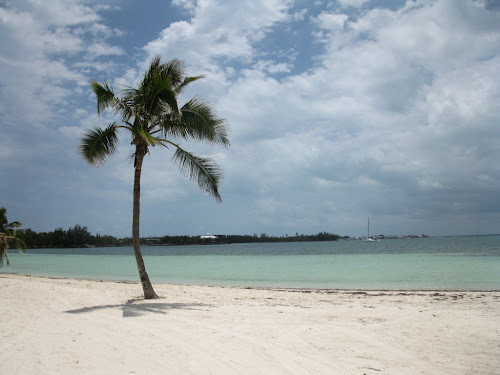 But then, when we got to the Bahamas we agreed that if that was as far as we went all would be good. We had accomplished something a lot of people never would. Then again when we got to The Dominican, and then Puerto Rico and so on. We have sailed just over 3000 nautical miles. This is an accomplishment, especially for rookies like ourselves. We have seen some amazing things that only a few will get to experience. We are stronger than I would have believed and braver (mostly) than I thought possible. We have met wonderful friends. Some for a day, some for a week, some forever. These are the memories that we will look back on and that was the reason we did it. Mission accomplished. We never intended this to be forever, just for a couple of years and how that time has flown. People have asked us what our favorite places were. Usually the best places coincide with the best people. That's what makes the memories. I have many, and over 12000 photos to remind myself. So many evenings Blue Moose's cockpit was full to overflowing with our friends. Sharing delectable goodies, music, laughter and the occasional (ha!) cocktail. We do love to socialize. Do we know you? Come on over anyway! My first Mahi. OK, fishing is well, fishing. To be honest I couldn't really care less. Until, of course we sailed through a school of Mahi. I was transformed into a superhuman Mahi slayer. The sight of thousands of them jumping everywhere around the boat. Then I reeled one in and I was...hooked! 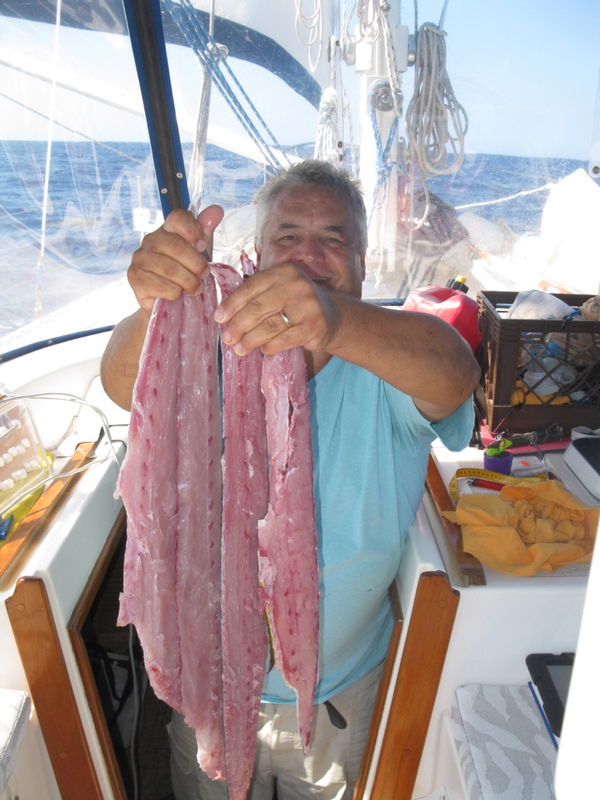 Truly, there is nothing like fresh Mahi cooked on your own boat. The perfect moonlight sail. On our return trip from The Dominican to The Turks & Caicos we had the perfect sail. The perfect wind, a rising full moon, the boat was perfectly balanced. There was no effort. Just ride along with the luminescence trailing behind. Simply magic. Sea turtles. I have written before about the dark things that lurk in the deep. I am a scaredy cat unless I can see in the water. The sneaky things that are waiting for the opportunity to nibble my toes. While snorkeling in Puerto Rico we came upon a sea turtle. Maybe a couple of feet long and looking just like the ones in Finding Nemo. For a little while I was a mermaid. He watched me and I watched him. We swam together and life was good. Blue. 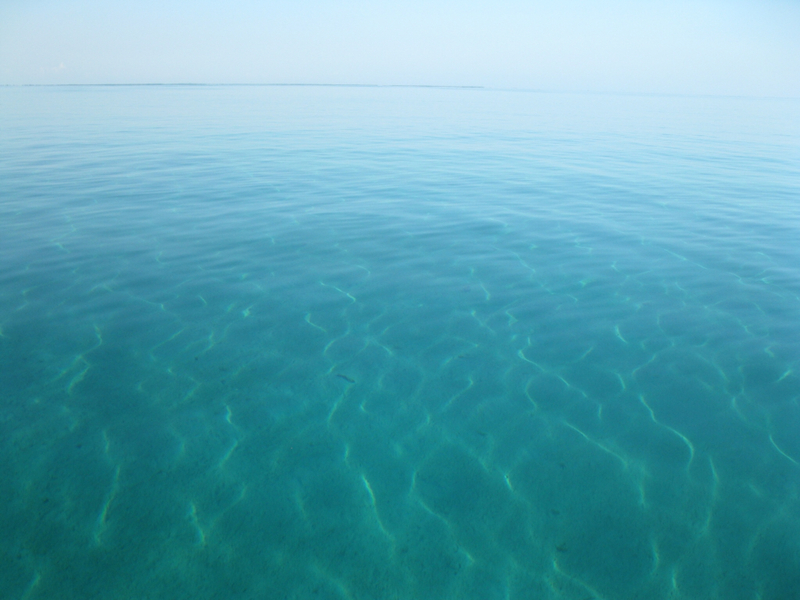 Once you have been to The Bahamas the colour blue is just not enough. There is 10 foot blue and 50 foot blue and then 100 foot and 1000 foot blue. With every depth comes a different shade and its something you need to experience to understand. When we approached Hidden Harbor Marina in St Augustine our first sight upon rounding the corner was our great friends Kath and Captain Dan waving from the dock yelling "Moosey!" Dolphins. Are you tired of the dolphins yet? I believe that dolphins are like kids. They are fishing along and one goes "BOAT! Let's go play!" Then they all race alongside. I swear they are smiling. Just look at a dolphin face. Doesn't that look like a smile? They will turn sideways in the water and look up at you and there's this connection. Wow! Over and over it still amazes me and never gets old. So, during our return trip we started scouting out real estate back home. We found a house that neeeeded us just two streets from our old house. We bought it. Without me ever seeing the inside. Gutsy? I guess. So while we went home for a visit we got to view it in person. While walking through the back yard I took a deep breath. It smelled woodsy, and like cut grass and it smelled like....home. I hope that whoever buys Blue Moose enjoys her as we have. She's sturdy and capable and loves the wind. 20 knots or better please. She is comfortable to cruise and comfortable to live in. She has room for friends and room for stuff as we well know. We offloaded over 30 boxes of "stuff" into the van. Apparently we didn't believe that food was available anywhere else in the world because we could have lived quite comfortably for months on our accumulated food stores. So there you have it. There are more stories and more photos and I will catch up eventually. I'm a little behind on posts but I'm going to fast track and tell you about our crossing first, then back up a little later. 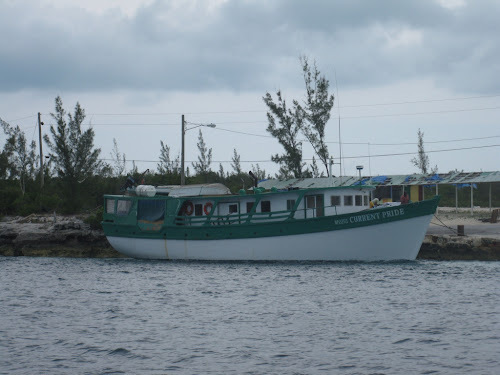 On Monday, the plan was to sail from Great Sale Cay to just at the edge of the banks where it's still shallow, anchor for the night then continue on first thing in the morning to Fort Pierce Florida. 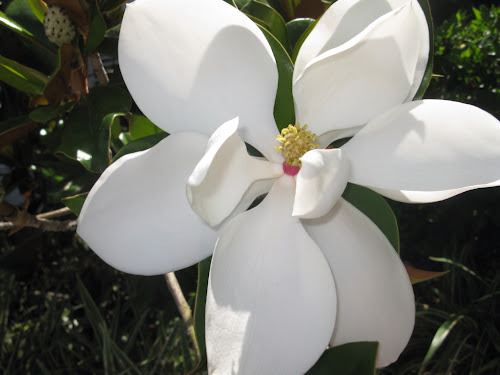 We had an agreeable weather forecast with winds with a southerly component. The gulf streams runs south to north so if the winds are from the north they do battle with the current going the other way. This produces nasty if not dangerous conditions. So we were good to go. The weather forecast predicted squalls, but a couple of days out so this would be the best time to cross. We motor sailed for most of the day accompanied by the occasional thunderstorm. As we approached the edge of the banks we circled around looking for an area shallow enough to anchor. Remember that this is kind of in the middle of nowhere. No land in sight. Although it was marked on the charts we couldn't seem to find anything in the 12 to 15 foot depth which is about the minimum we wanted to anchor in. We eventually decided that since the weather looked like it was building that we would just continue on to Florida expecting to make landfall about daybreak. It's surprising how little boat traffic we see. For a little while we could see another boat way back behind us but then it was gone. Just before before midnight a cruise ship passed about a mile in front of us, then that was it, just us. We weren't making any speed records that night and were hoping that once we entered the Gulf Stream we would get a big push north. For a little while that did happen and we got up over 7 knots but it was short lived. The stream was moving us sideways so that we were off course by over a mile but it wasn't giving us any additional speed. So we plodded along all night. The thunderstorms were all around giving us an amazing light show. With all the cloud cover we had no light from the moon so other than the flashes of lightening it was dark, dark, dark. The seas weren't overly big but the waves seemed to come from all directions making things that had never moved before fly onto the floor with a crash. Each time it happened we would look below at the mayhem. A full jug of cat litter slid along the floor and into the side of the garbage can, tipping it over. It was full of course and sent wet coffee grounds flying in about a 3 foot radius. While pouring us some coffee and only having two hands, the carton of milk slid into the fridge before I could get the lid closed. Oh dear! its going to be a big cleanup tomorrow. Que Sera Sera was up ahead but going a little faster than us and eventually we lost sight of their lights as well. This is when we had a strange experience. Brian was steering and I would occasionally check our progress on the IPad. Brian suddenly told me that the chart plotter was going crazy. Looking at the compass, it said we were going southwest. We were supposed to be going northwest. We doubled checked on the chart plotter to find the entire image spinning crazily. The IPad was the same way. Remember, it's black dark. No light of any kind in any direction. We had no idea which direction we were heading. After a few very long minutes of "what do we do now?" everything returned to normal but not before we did 1 or 2 complete circles. This happened several times over the next few hours. 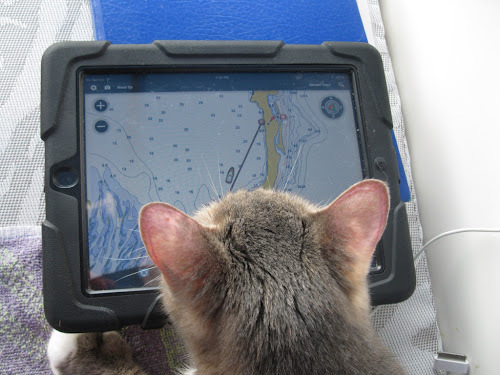 Although the middle of the night in the middle of the Gulf Stream is not the ideal place to start using it, we do know how to navigate without electronics. Thanks to The Peterborough Power & Sail Squadron for this knowledge, reinforced by our practical training with Captain CJ at Blue Water Sailing School. Eventually we could see the dim glow of lights from the coast of Florida and that gave us something to aim for. Then we noticed the second weird thing. 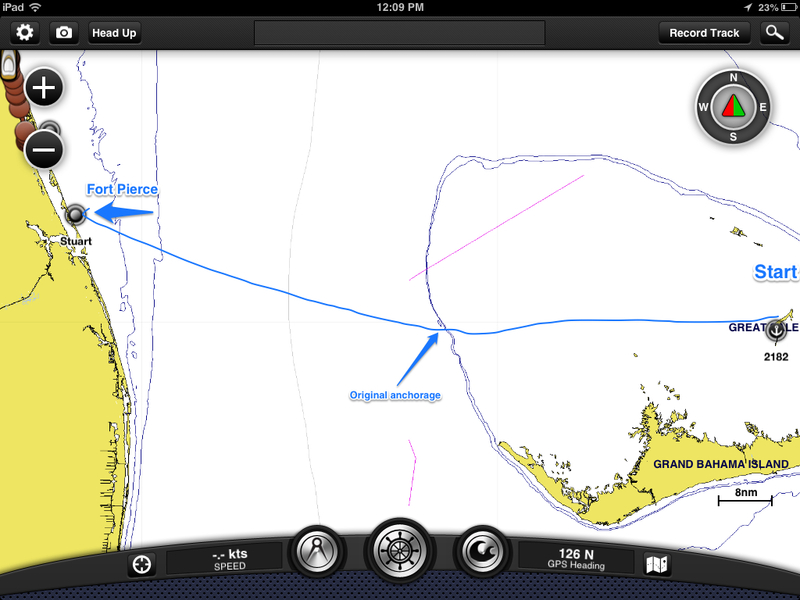 Our speed which up until then had been averaging 5 to 6 knots was now .9 knots. We were moving so slowly we were almost going backwards. I have no explanation for all this, just a couple of theories. Perhaps our chartplotter malfunction was caused by an electrical interference from the surrounding thunderstorms. Our huge drop in speed could have been caused by an eddy in the western wall of the stream. We reached Fort Pierce at 9:30am, but that last 10 miles seemed to take an eternity. 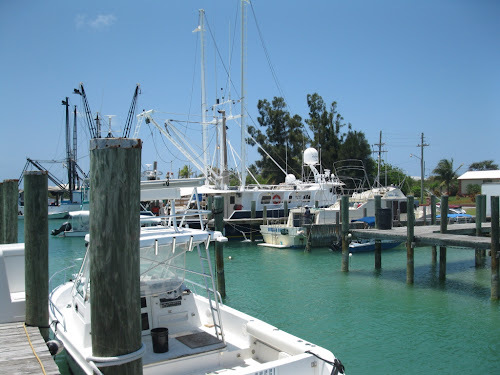 We arrived in Spanish Wells a little late in the day so our first stop was to the fuel dock to fill the tanks. While Brian dealt with the fueling I took a run down the street to the grocery store. We were lacking in a few essentials like eggs, bread and ORANGES! That was the first thing I looked for. When I returned to the boat the tank was full and paid for and the fuel docked closed. We called the marina where we had a reservation without any luck. They too apparently closed at 5. Well, we could just go grab a slip or maybe stay where we were. Nobody seemed to care that we were there, so we stayed tied to the fuel dock for the night. Fishing boats came and went and I was sitting in the cockpit catching up on emails when I heard a familiar voice. Glancing up I saw Mirella who owns Pasadena Marina where we had spent the previous summer. I'm not sure who was more surprised! Mirella, Wade, Kim and Bill had been out on their boat, experienced engine troubles and had just made it to the fuel dock. It's funny when you run into someone you know in the most unlikely places. The next morning we were up early expecting to be kicked out at the crack of dawn. The fuel dock didn't open until 8 so we enjoyed a leisurely coffee then moved just a little jump down to Spanish Wells Yacht Haven. It's a small marina, nothing fancy but everything we needed. 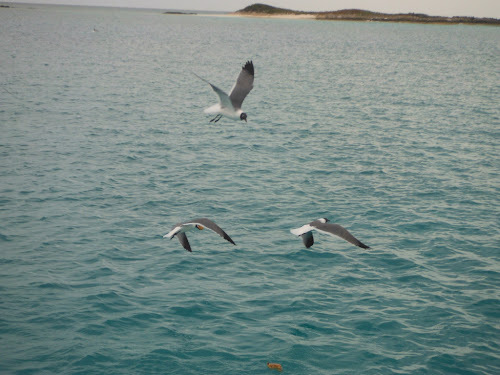 The next day...on to The Abacos. We had a couple of choices on which way to go. 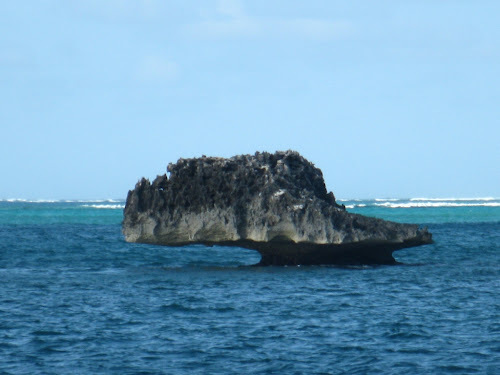 We could go around the point which would take a couple of hours or navigate through The Devil's Backbone which is strewn with coral heads. Coral heads can be deceptive. Usually they are well marked on charts but that doesn't really tell you how far under the surface they are. On a well lit day with polarized sunglasses you can see them quite well as a black blob in a sea of green. With a name like the Devil's Backbone we opted for a nearly sure thing and hired a pilot boat to guide us through. There were 3 boats and we ended up being number 3 in line. The directions that came over the radio were "boat 3 over to starboard". "number 3 pick it up a little" "Blue Moose stay right in line". Yes, it was a little hairy but we made it through just fine. A $30 charge for a sense of security. 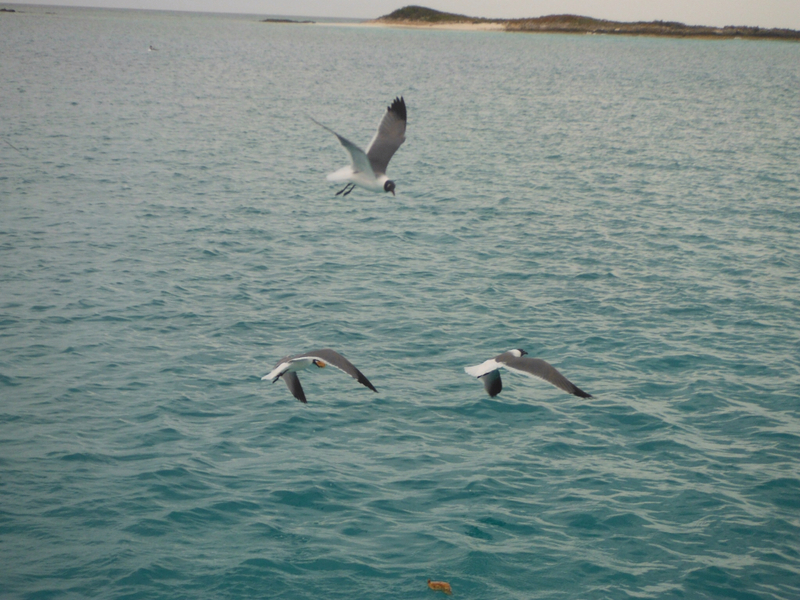 We had an all day motor sail across to Great Abaco in deep water so of course we fished. 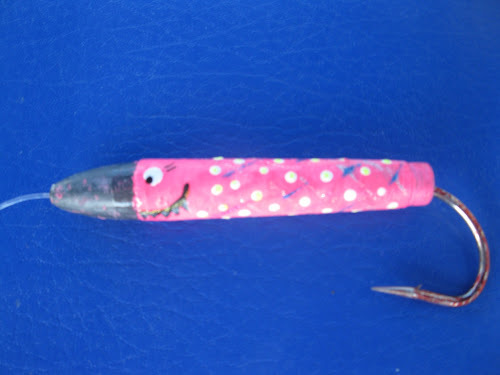 We borrowed a lure (pink and white of course) from Don. One fish, two fish! I had the honors of reeling this one in and it was touch and go who was going to win. I had my feet braced on the side of the boat and the end of the rod jammed into my stomach. I would gain 50 feet and it would turn and run. Brian ended up bracing the rod on his shoulder because we were afraid it would snap. A sweaty 30 minutes later it was relaxing in the cockpit with a shot of whiskey. For those that don't know this, if you pour alcohol into a fishes gills it subdues it immediately. Good thing, because when they flip and flop I jump too! What I didn't find out until the next day was that we were in over 12000 feet of water. Isn't that staggering? That's over 2 miles! We spent the night kind of in the middle of nowhere and continued on the next day to Marsh Harbor. Sorry that it's been so long. Wifi connections have been hard to find and not very reliable. It's a good thing that I keep the log book up to date because I am often checking back to see where we were and when. We have been moving at a fast forward kind of pace with a goal in mind. Lois and Don, who we are traveling with are meeting their grandson in Marsh Harbour on the 13th. Then we'll relax for a bit. 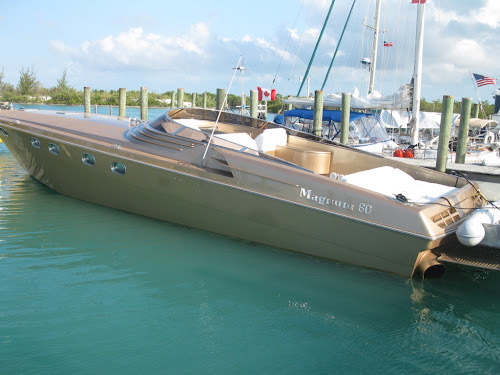 From the Turks & Caicos we did 62 miles to Mayaguana. Then the next day another 69 miles to Lady Slipper Cay on Acklins Island. A really pretty place to drop the hook. We had beach on 3 sides and a calm place to sleep then we were off the next morning bright and early for Rum Cay. The next day we were at Conception Island. We were hoping for a good snorkel because it is known to be a great site but it was cloudy and the water choppy so perhaps the conditions were not ideal. 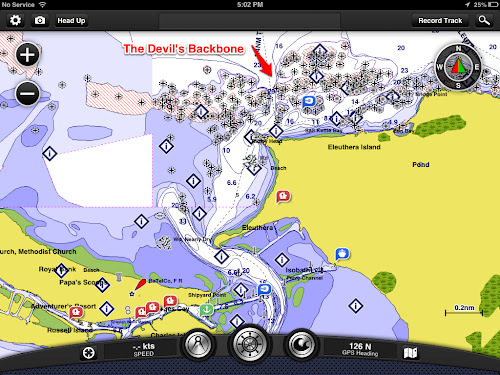 When we arrived back in George Town the anchorage was nearly deserted. When we had left the beginning of March there had been over 200 boats there. Now I don't think there were 20, and most of those were leaving shortly. 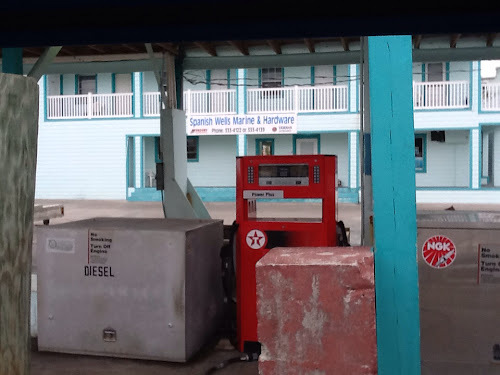 When we stopped in at Exuma Yacht Club to fuel up we found that they were experiencing financial problems, had laid off all the restaurant staff and only had about 100 gallons of diesel on hand. 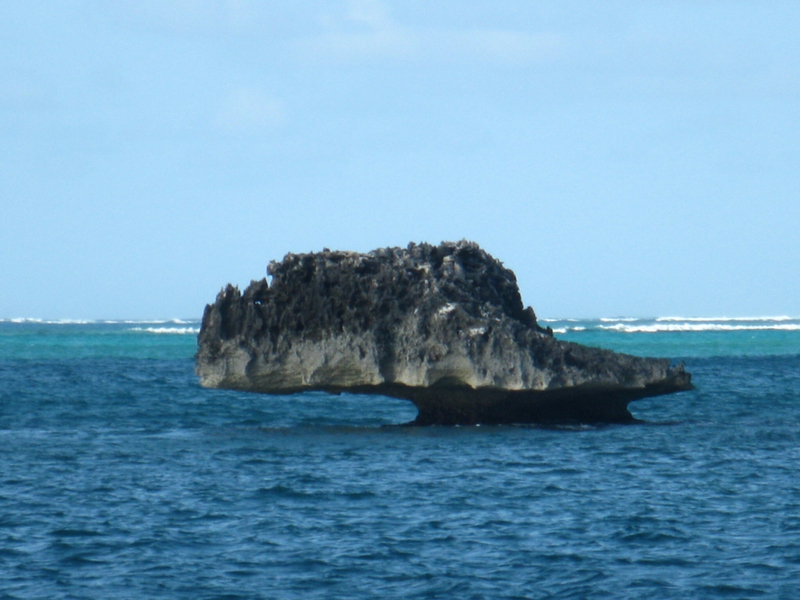 We grabbed a mooring ball in the hurricane hole on Stocking Island and took a break. It's very protected in there. Perhaps a little too protected because once the sun started to go down the Mosquitos and no-see-ums came out by the millions. I have never, ever seen Brian even slightly itch from a bite, but me.....oh, it's awful. After going to St Francis for dinner the first night I'm sure that they followed us back to the boat. By the time I was inside the boat I didn't have enough hands to scratch everywhere that itched. I tried Benadryl and cortisone with no relief. Finally Brian swabbed me with rubbing alcohol which helped for a little while. After a tip from a friend (thanks Gina!) I found that Oragel will numb the itch. While I didn't exactly have Oragel, I did have Walgreen's oral anesthetic paste. It was a little like rubbing toothpaste all over your body, but it worked like a charm. I think poor Cricket suffered from bites as well because she was scratching quite frantically and now has a big bare spot on her tummy. From here, we decided on a different route north. 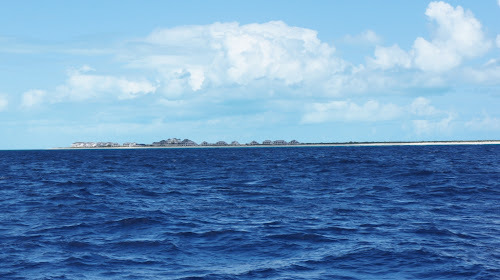 We headed to Cat Island, then Little San Salvador. 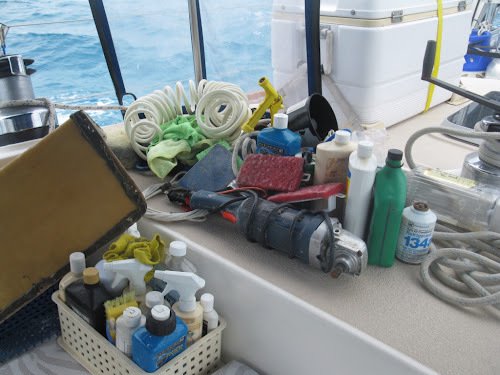 We had been joined by another boat in our flotilla and it was as we were about to drop anchor that they radioed to us that they had experienced a problem with the furling system on their headsail and it had fallen down on their deck. Brian, having a solution for nearly every problem offered his assistance. He loaded our dinghy with tools and our bosun's chair to see if he could repair the furler. Being a 26 foot sailboat, Brian was a little too big to go up their mast so it was up to the captain who was afraid of heights. What a difference between this little boat and the Moose. Little winches and skinny lines, but several hours later the repair was complete. The ball bearings that had bounced onto the deck and then into the water when everything fell to the deck were not in our stash of spare parts. McGuiver himself came up with the idea to use shot out of a shotgun shell. While not a perfect fit, it did the trick. Little San Salvador looked like a perfect place for lobster. We had to slowly pick our way through coral heads to get to the anchorage and coral heads are where these guys hang out. Unfortunately all the big coral heads ended up being too far from us. The wind totally died and by sunset you couldn't see where's the water ended and the sky began. 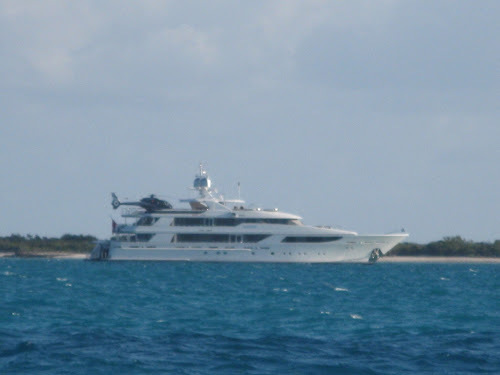 Our next destination was Eleuthera. The wind had abandoned us and we were lucky to see anything more than 4 knots all morning so we were back to motoring. We were however going through some deep water (over 1000 feet) and this is where the fish are. The good to eat ones anyway. 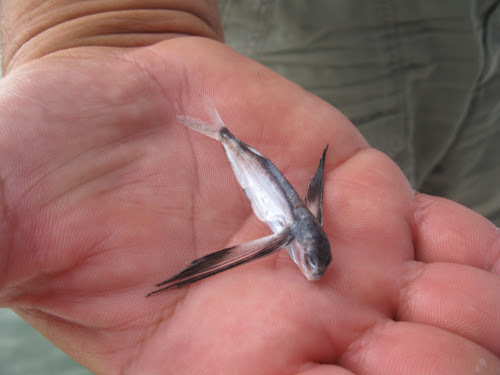 We had a little bad luck with our best catching lures. One, we ran over and other someone else ran over. The tackle box was getting a little low so Brian got me to dress up a plain cedar plug. He told me to paint whatever I wanted on it. All morning long we heard reports from the boats ahead of us. Mahi!.........another Mahi! Sigh! Maybe I painted the wrong colours, or perhaps the grin was too intimidating. Who am I kidding? I don't think the tuna looked before he took a big bite! That was the catch for the day. tuna! I'm happy that my creation caught something. 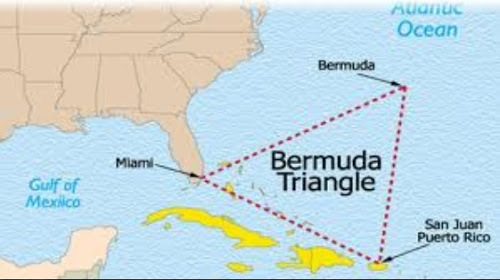 I have always wanted to see Eleuthera. Mostly I guess because it just looks so amazing from the air. It is 110 miles long and at some points less than a mile wide. The first 5 miles was through Davis channel where we met a mailboat coming in the opposite direction. I was a little worried that there wouldn't be room for both of us but we passed port to port and there was lots of space. So with all of these long days some people wonder how we spend our time. Truly, it gets monotonous some days. When all there is around you is water it can lull you into a near coma. Our big excitement could be spotting another boat on the horizon or seeing how far a flying fish can actually fly. When the weather is good one there's no excitement (usually). One of us needs to either supervise the autopilot at all times or steers. The autopilot while operating better than it has, has this annoying habit of waiting until one of us remarks on the fact that it's behaving and then...it does an about face. Steering in light winds and seas is easy. A finger or a toe on the wheel and a slight course correction here and there is all it takes. Heavier seas and winds takes a little muscle. It's true that you can't hand steer as straight as the autopilot. Checking back on our track line some days it looks like a drunken sailor. It zigs and zags all over the place. So, other than steering, what do we do? We take turns reading. I have a new addiction to a Soduko app on the IPad. I won't comment on how many hours I have logged playing it but I keep trying for a better time than the one before. It's very annoying when Brian asks me for something that interrupts a game. Then there's sustenance. Sometimes we eat before we leave, but more often than not its breakfast while underway. Eggs are easy. Fried, scrambled or fold them into a wrap. Toast, if we have bread. The nice thing about a percolator is the ability to reheat coffee without it getting bitter. Water...water...water. Water with lemon, water with Mio and just plain water. 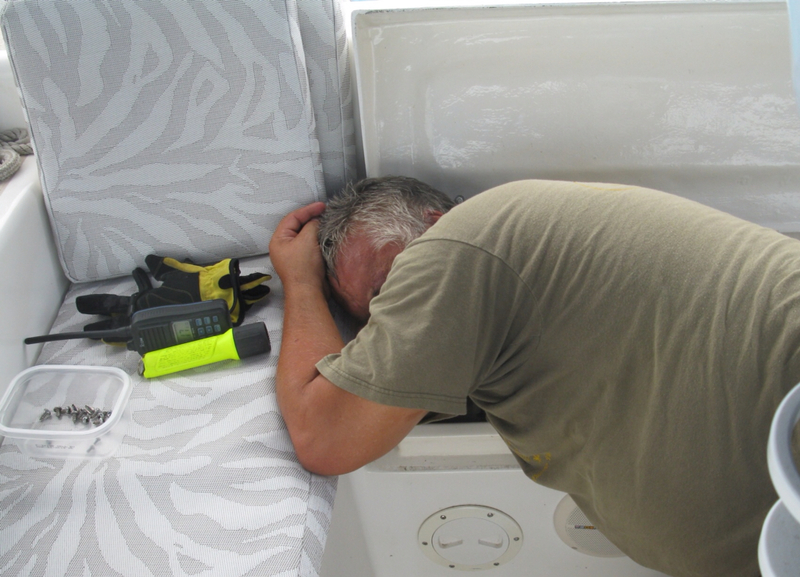 Just yesterday while Brian was making an underway repair to the fan on the inverter (another story) I was left to steer for several hours. The engine room is extremely hot and Brian came up soaked in sweat. He remarked they he would kill for a Ginger ale. Of course we had none. So as I steered along I thought about ginger ale. This thought morphed into a cookie, then ice cream and then settled on an orange. Everything that was not readily available. All I wanted right now was an orange. As much to eat it as the fun in tossing the peels overboard and watching them drift off behind us. All our organic stuff goes over the side. Veggie scraps, banana peels, fish carcasses. You have no idea how bad chicken fat can smell after several days on a 90 plus degree boat with no available garbage can. So, back to the underway repair. While going below at one point yesterday I heard this awful grinding noise that seemed to be coming from behind the kitchen sink. After a long search it was found to be the fan on our inverter. The inverter turns battery power in house power. In other words all our electrical outlets, the washer and TV. Not a small task because the inverter (along with everything else) is in a hard to reach place. Under one of the seats in the cockpit is a lazarette or storage bin. This is filled with boat cleaner, wax, bungee cords, pumps, fresh water hose and basically lots of junk we need above deck. Inside is a removable panel which gives access to the far side of the engine room. It has lots of screws. I know this because I have removed and replaced then many, many times. Once Brian had the fan removed, he found that a piece of what looked like a twist tie had fallen into the fan causing it to jam, eventually crack and cause the terrible noise. If there's something we have an abundance of on Blue Moose it's spare parts, but not a fan for the inverter. Brian did however gut an old laptop several months back and the fan that he saved from this is working perfectly. By mid afternoon yesterday we had a little scenery coming up. There is a cut between Current Island and the top end of Eleuthera. Going through this cut would save us about 8 miles of travel time but was not without it's challenges. Being such a small channel the current is reported to really rip through here sometimes up to 8 knots. We hoped that we had timed the tides right so it would push us through. As we turned into the channel the boat started to move. We flew through the channel at 7.4 knots with the engine at an idle. Once clear of the cut we had another hour and a half to Spanish Wells. Brian put all the boat bits back together while I played captain and Cricket joined me on deck as first mate. It seems that a lot of you love Cricket as much as we do. She seems to have developed her sea legs now. No longer confined to the forward head she's a cat aboard. Sometimes a cat on deck, but mostly a cat on the floor. Most recently she's a cat in the food locker. 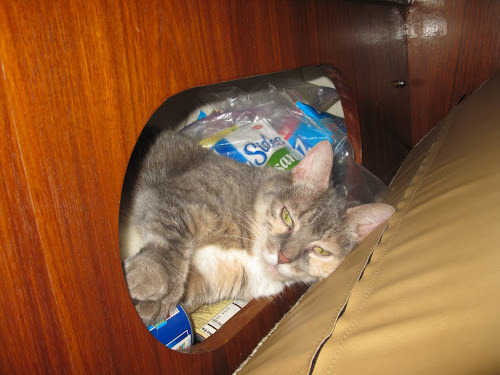 This seems to be her cubby of choice while we are underway. I found her here a few days ago. 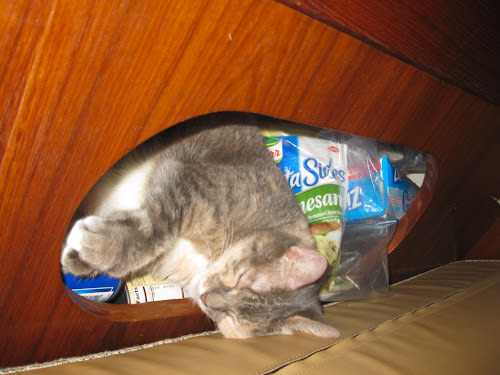 It was a little rolly while we were sailing and the cushion in front of one of the food lockers fell over. Cricket grabbed the opportunity and climbed in. Sleeping on top of cans of tomatoes and packages of noodles with her head on a box of Ziplock bags she seemed quite happy. She makes regular trips to the food and water bowl. Looks up at us in the cockpit and meows "you guys OK up there?" And heads back for another little nap. 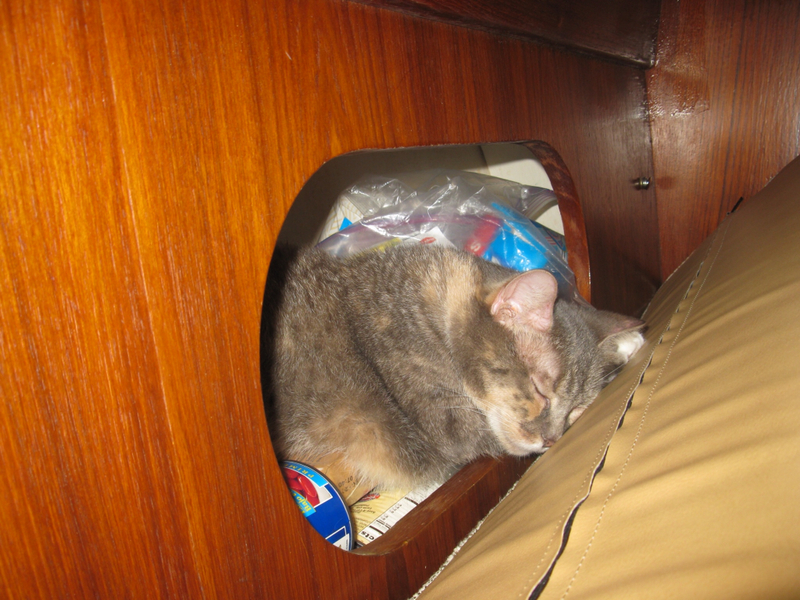 Once the passage is over she comes out for her after sailing treats and has....another little nap. She is a senior after all and needs her sleep. She has adapted very well. 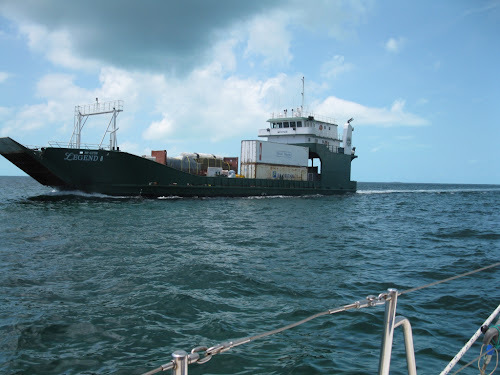 We figured we had about a 24 hour run, give or take to an anchorage in West Caicos so set our departure time for about noon. 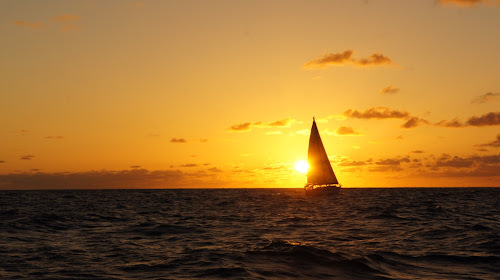 A nice sailing day, northwest into the sunset. Although I'm not big on overnight passages, this was a beautiful night. A magnificent sunset, then a little later a spectacular moonrise. It's always nice to have the moon along when you're traveling at night. It was so bright it was almost like sailing during the day. On occasion one of us would venture down below for a snack, some coffee or a bathroom break. Cricket could either hear us or see the light of the flashlight because we would hear "meow?....mom?" Meow!...Mom! Can I come out? It's not like we don't let her out, or feed her or anything. She gets her regular meal times and little breaks for some loving. 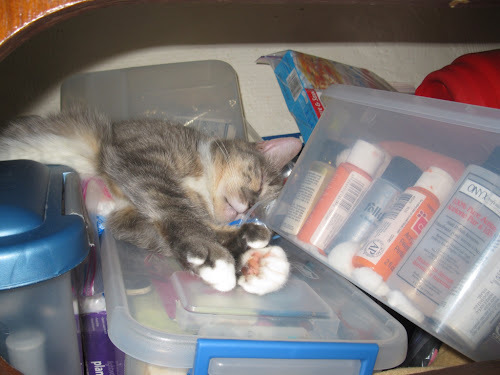 This night she persisted so we let her out. 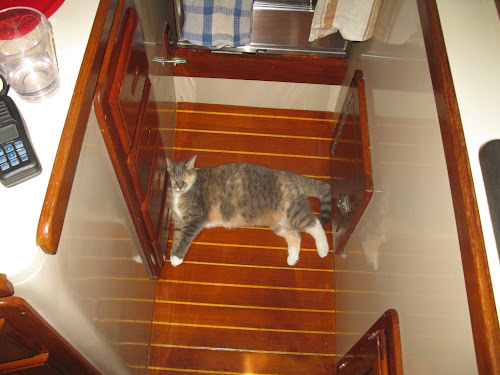 We had to keep the baby gate (companionway screen) in to keep her down below. I don't think it would be fun to be looking for a chunky senior kitty doing the cat-paddle in the middle of the Atlantic Ocean after dark. Or any time for that matter. For the rest of the night she picked somewhat comfy spots all over the boat. Sometimes just flat out on the floor, sometimes under the covers on the bed, but she seemed to be fine with the whole sailing thing now. As the night wore on the winds dropped to the point that we needed to start the engine to give us a little boost but it was a good night. 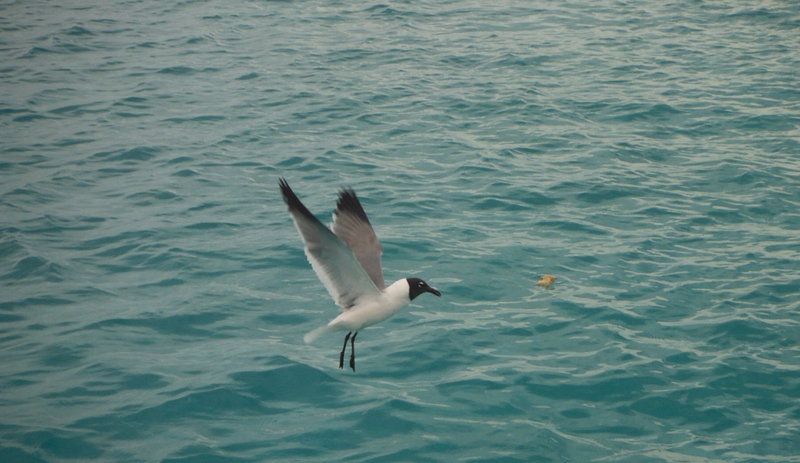 So good that our estimated arrival at West Caicos was much earlier than planned. As we got closer the anchorage looked just a little rolly so we made the decision to round the corner onto the west side where there were some mooring balls and an anchorage. 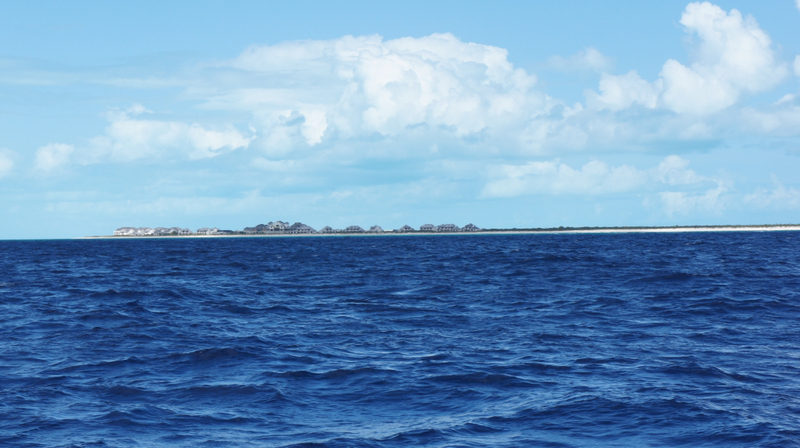 On West Caicos I don't think there is anything. An abandoned marina and community. We considered heading into the marina for the night but not knowing what was inside changed our mind. We opted instead to head for Provindenciales. 2 plus hours later we arrived at Sapodillo Bay. A nice place to get some rest. We didn't plan on going ashore. 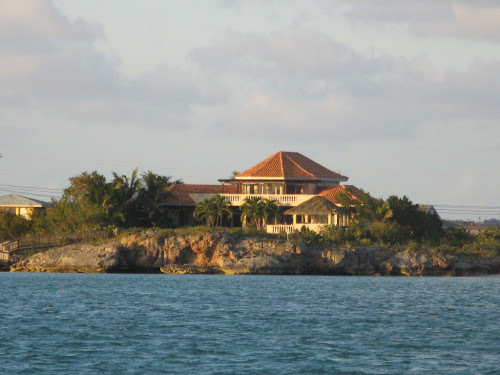 The Turks & Caicos charge $300 entrance fee and we were only staying a day or two. 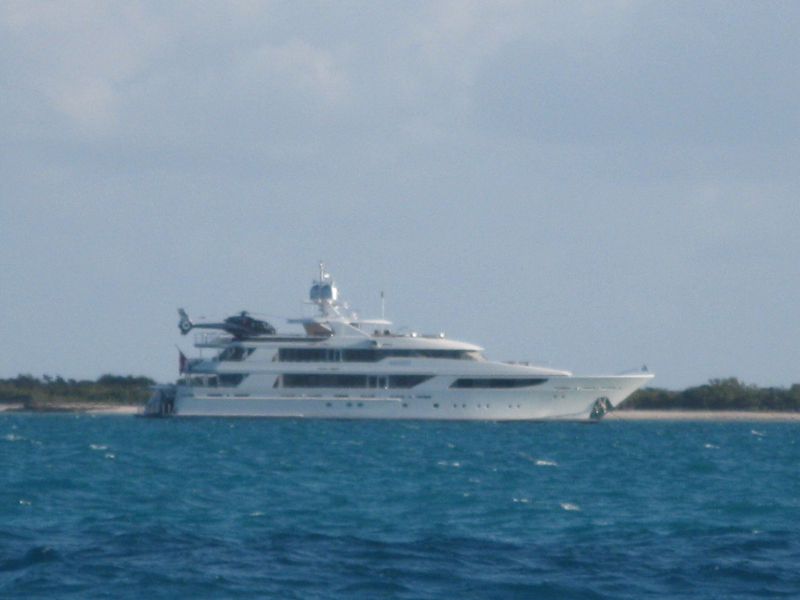 Just in case you didn't know what to do with your extra millions, how about a helicopter for your boat? We lay low for another day. A day of catching up. Next stop the Bahamas. Brian, Sally and Cricket the cat sailing on our 41 foot Morgan Classic sailboat. In October 2011 we sold our house, quit our jobs and set out for Florida in search of a sailboat. We found her in Madeira Beach Florida. A 1987 41 foot Morgan Classic. Our plan is to sail for a couple of years. First to the Bahamas, after that...who knows.